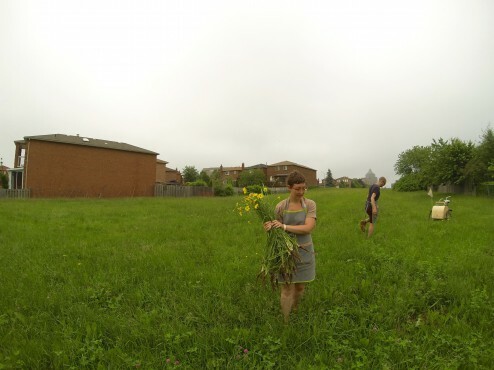 As part of the Luminato Festival, they have been collecting plant life in three iconic Toronto neighbourhoods and have been hard at work at The Theatre Centre turning their finds into tasty, community-specific popsicles. Sample these chilly treats at the Luminato Festival Hub (King St W & John St) starting at the First Night Garden Party on June 19, the Pan American Food Festival on June 21, and at the Festival’s closing night, June 28. Eric and Mia shared some pictures, videos, and anecdotes from the “Hunter, Gatherer” portion of their explorations in Toronto. Check it out below and then taste their final product at the festival! Stay tuned for another post all about the processing and purveying of these foraged materials into tasty frozen treats. Yellow Goat’s Beard- one of the ingredients in the Malvern popsicle- was collected in part from a meadow. We found a few of these spaces dotting the neighbourhood- open, fertile ground between houses that stretched for blocks. While we’re out in the field, we like to look for edible plants up close and from all angles. 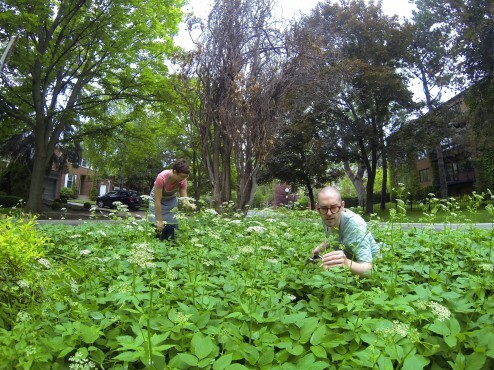 We spend long periods of time trying to identify new-to-us plants. Our reference books are indispensable! 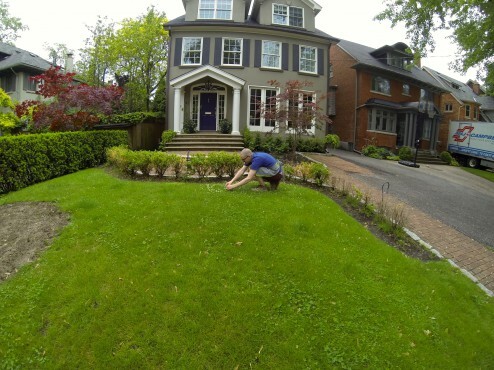 The mature lawns in Rosedale provided a bounty of clover. Finding Yarrow from The Theatre Centre on Vimeo. Finding Alfalfa from The Theatre Centre on Vimeo. For Hunter, Gatherer, Purveyor: Part 2, CLICK HERE.